Achieve superior control and performance across multicloud environments with IBM Multicloud Manager. 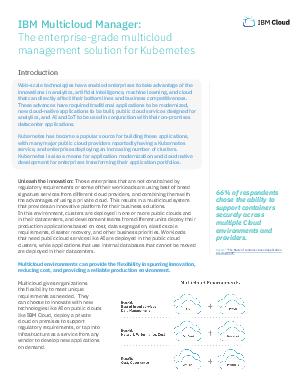 With a multicloud strategy, it can become time-consuming, expensive and difficult to manage environments as you contend with scattered visibility, security and workloads across multiple Kubernetes clusters and clouds. IBM Multicloud Manager integrates all your environments in a single view that gives you optimal control over how you see, govern and automate everything.